On 20 December 2017, Mariken successfully defended her PhD dissertation-congrats! For endorsements and for ordering, check out Cambridge University Press's website. [NEW] Vis, Barbara & Dieuwertje Kuijpers (2018), ''Prospect Theory and Foreign Policy Decision-making: Underexposed Issues, Advancements, and Ways Forward', Contemporary Security Policy [link to open access article] . [NEW] Vis, Barbara (2018), 'Heuristics and Political Elites' Judgment and Decision Making', Political Studies Review (early view). [link to open access article]. Linde, Jona & Barbara Vis (2017), 'The Uncertainty of Welfare Retrenchment's Electoral Consequences', DaWS Working Paper Series, 2017-1. [link to article]. Vis, Barbara (2017), 'Prospect Theory', in Fathali Moghaddam (ed. ), The SAGE Encyclopedia of Political Behavior, Sage, pp. 670-672. [NEW] Van der Velden, Mariken, Gijs Schumacher & Barbara Vis (2018), 'Living in the Past or Living in the Future? Analyzing Parties' Platform Change In-between Elections, The Netherlands 1997 - 2014', Political Communication (online first article). [link to article (gated)]. [NEW] Van der Velden, Mariken (2017). Political "Frenemies". 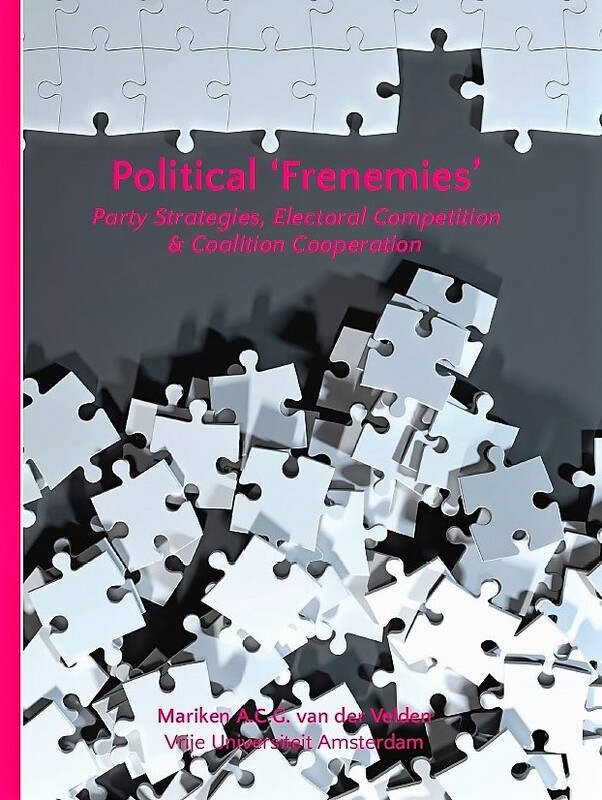 Party Strategies, Electoral Competition & Coalition Cooperation. PhD dissertation, Vrije Universiteit Amsterdam (defended: 20 December 2017). [link to full text dissertation]. Schumacher, Gijs, Marc van der Wardt, Barbara Vis & Michael Baggesen Klitgaard (2015), 'How aspiration to office conditions the impact of government participation on party platform change', American Journal of Political Science, 59(4): 1040-1054. [link to article]. Blogs on the article available in English, in Danish, and in Dutch. Van der Velden, Mariken, Gijs Schumacher & Barbara Vis (2015), 'Do Parties Respond to Electoral Prospects? ', Paper prepared for presentation at the 73rd MPSA Conference, 16-19 April, 2015, Chicago [link to conference paper]. Paper also presented at the 4th Annual EPSA Conference, 19-21 June, Edinburgh, Scotland, and at the ECPR General Conference, 3-6 September, Glasgow, Scotland. Van der Velden, Mariken & Gijs Schumacher (2015), 'Drifting Apart or Sticking Together? An Analysis of Coalition Partners’ Behavior in 11 Western European Countries',	Paper prepared for presentation at The Manifesto Project User Conference, 5-5 June, Berlin [link to conference paper]. A previous version of this paper has been presented at the 73rd MPSA Conference, 16-19 April, 2015, Chicago. Baggesen Klitgaard, Michael, Gijs Schumacher, Barbara Vis & Marc van de Wardt (2015), 'Office Rookies Feeling the Blues: Why and How Parties Change After Office Attainment', Paper prepared for presentation at the 73rd MPSA Conference, 16-19 April, 2015, Chicago [link to conference paper]. Schumacher, Gijs, Marc van der Wardt, Barbara Vis & Michael Baggesen Klitgaard (2013), 'Do Opposition Parties Change Their Platform? ', Paper prepared for the ECPR General Conference 2013, Bordeaux, France [available on request]. [NEW] Kuijpers, Dieuwertje (2018 forthcoming). 'Rally Around All the Flags: The Effect of Military Casualties on Incumbent Popularity in 10 Countries 1990-2014', Foreign Policy Analysis (accepted for publication). Kuijpers, Dieuwertje & Gijs Schumacher (2015). 'Don't Mention the War vs Stick to Your Guns: Political Party Responses to Military Interventions', Paper prepared for presentation at the 73rd MPSA Conference, 16-19 April, 2015, Chicago [link to conference paper]; [link to appendix]. Kuijpers, Dieuwertje, Barbara Vis & Wolfgang Wagner (2014). 'Diverting or Gambling? Re-reading the Diversionary Use of Force Literature from a Prospect-theoretical Perspective', Paper prepared for presentation at the Fourth Global International Studies Conference, 6-9 August, Frankfurt, Germany [available on request]. Kees van Kersbergen & Barbara Vis (2017). 'De Toekomst van de Verzorgingsstaat in Verkiezingstijd: Politieke Partijen Waarschijnlijk Weer Gul', Maatschappij & Politiek (M&P): Vakblad voor Maatschappijleer, 1: 4-7. Kees van Kersbergen & Barbara Vis (2016). De Verzorgingsstaat. Amsterdam: Amsterdam University Press. Van Kersbergen, Kees & Barbara Vis (2015). 'Three Worlds' Typology: Moving Beyond Normal Science? ', Journal of European Social Policy, 25(1): 111-123. Doi:10.1177/0958928714556974. Van Kersbergen, Kees & Barbara Vis (2014). 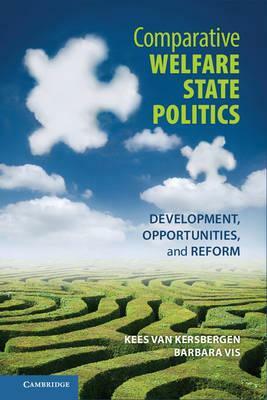 Comparative Welfare State Politics: Development, Opportunities, and Reform. Cambridge: Cambridge University Press. Vis, Barbara (2013), 'Fundamenteel Onderzoek voor de Publieke Zaak?! Wanneer Impopulaire Maatregelen te Nemen en hoe ermee Weg te Komen' (Fundamental Research for the Public Cause?! When to Take Impopular Measures and How to Get Away with it), in: van Genugten, Marieke, Honingh, Marlies & Trommel, Willem (eds. ), Passie voor de Publieke Zaak (Passion for the Public Cause). Den Haag: Boom Lemma, pp. 19-36. [NEW] De Block, Debora & Barbara Vis (2018), 'Addressing the Challenges Related to Transforming Qualitative into Quantitative Data in Qualitative Comparative Analysis', Journal of Mixed Methods Research (Online First). [link to open access article]. De Block, Debora & Barbara Vis (2017), 'Addressing the Challenges in Using Qualitative Data in Qualitative Comparative Analysis', COMPASSS Working Paper, no. 2017-88. [link to open access article]. Vis, Barbara & Jan Dul (2016), 'Analyzing Relationships of Necessity Not Just in Kind But Also in Degree: Complementing fsQCA with NCA', accepted for publication in Sociological Methods and Research [link to open access article].